Readers of The Occidental Quarterly are probably unfamiliar with the work of Guillaume Faye, but his ideas are increasingly those of Europe’s nationalist vanguard. An early associate of Alain de Benoist and one of the architects of the European New Right, the young Faye left politics in the late 1980s to pursue a career in media. In 1998 he returned, instantly re-establishing himself as the intellectual force on the nationalist right. 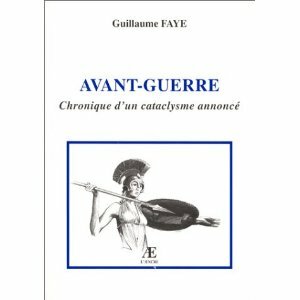 His latest work—Avant-Guerre: Chronique d’un cataclysme annoncé (Pre-War: Account of an Impending Cataclysm)—is reminiscent of Spengler’s Hour of Decision. Like Spengler, Faye looks at the storm clouds on the horizon and predicts that within ten years a coming era of world-altering tempests will descend on the white race, determining if it is to have a future or not. In his view, these cataclysms will be neither ideological nor economic in character, but (à la Huntington) racial and civilizational, involving clashing continental blocs and warring ethno-racial groups. They are thus likely to engender unprecedented violence and destruction, forcibly shaking white people from the stupor that is leading them toward extinction. Although presently unprepared to fight such wars and alienated from all that is distinct to their race and heritage, the struggles of the twenty-first century, he believes, will give Europeans on both sides of the Atlantic a final chance to throw off the forces that have denatured and debilitated then over the last half century. Like most “nationalists” who fight in Europe’s name, Faye is extremely critical of the American government and the role it has played in repressing the worldwide forces of white solidarity. But unlike many on the anti-American right, Faye does not believe the U.S. is Europe’s principal enemy, even if its Judeo-liberal New Class has been responsible for eroding European autonomy and demonizing its culture. An enemy, he contends, does more than corrupt and intimidate, it threatens one’s biological existence. Taking his cue from Carl Schmitt, he thinks it is more accurate to characterize the U.S. as Europe’s “adversary”—an adversary that needs to be opposed if Europeans are ever to re-assert the Faustian project distinct to their ethos—but nevertheless one with whom a life-and-death struggle is not at all inevitable. The real enemy threatening the white homelands comes, he claims, from the Third World. Accordingly, the terror attack of “9/11” suggests one form his predicted cataclysm will take. But while Islam is Europe’s principal enemy, it is not, paradoxically, America’s. Based on the work of General Gallois, Alexandre Del Valle, and a new generation of European geopoliticists, Faye argues that Islam has long served the U.S. in furthering the hegemonic ambitions of its global village, specifically in dividing Europe and weakening Russia. That its recruitment and arming of Islamic fanatics to fight in Afghanistan and Chechnya and in Bosnia and Kosovo at last boomeranged ought not to detract from the fact that for a quarter century the U.S. systematically incited Islamic insurgencies for the sake of its strategic aims. In Faye’s view, America’s principal Third World enemy, and thus the power it will face in World War III, comes not from the Middle East (even if militant Islam continues to target it), but from a rapidly developing and technologically armed China bent on contesting its dominance in the Pacific. In this potential Sino-American conflict, Faye believes the future lies entirely on the Chinese side. Unlike the Middle Kingdom, the U.S.’s disparate mix of race and cultures has left it without a coherent heritage and thus a destining project worth dying for. This makes it not a nation in the European sense, but simply une symbiose étatico-entrepreneuriale. Because such an entity is likely to fly apart if challenged by a determined enemy, in the great cataclysms to come it will be Europe (and Russia), not the U.S., that will stand at the center of the struggle to defend the white West from a hostile non-white world. While America’s future holds out the prospect of an interstate war with China, Faye believes Europe faces an intrastate war with the forces of an insurgent Islam—a war, to repeat, that will resemble 9/11 more than the conventional military engagement the U.S. can expect in the Pacific. Within such zones, whose deteriorating conditions politically correct public officials persist in describing in socioeconomic rather than biocultural terms, it is nearly impossible for a Frenchman to reside in the public housing estates (HLM) built for the French working class, to find a café serving wine or ham, or for his wife to dress or behave in public as do European women. In contrast to the Little Italies and Germantowns arising in many American cities in the last century, these non-European enclaves have not the slightest intention of assimilating into the dar-al-Harb (the “impious” non-Islamic world, which Muslims view as the “world of war”), and have, in fact, begun to assert their autonomy vis-à-vis it. In recent years, hardly a week passes without a newspaper report of a riot or bloody incident provoked by clashes between police and Muslim gangs. Since 1990, urban violence has grown five percent annually—since 2000, by ten percent—as the anomie, violence, and disintegration associated with America’s inner cities becomes an increasingly familiar European reality. In fact, in 2000, for the first time in history, French criminality, whose ethnoracial character is overwhelmingly non-European, surpassed that of the U.S. crime rate; and Paris, once the City of Lights, became the least safe of the major European cities. 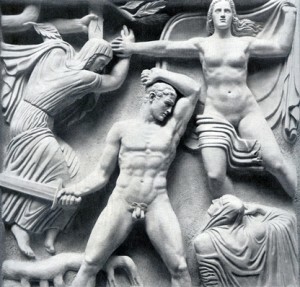 In the face of these threats to the continent’s demographic, cultural, and institutional foundations, the media, the academy, and the established “anti-racist” organizations (mostly controlled by Zionists) attempt to silence whoever criticizes such changes, all the while making the term “multiculturalism” emblematic of the mobile postmodern society of optional values and fashionable identities that comes with globalization. Instead, then, of mobilizing the Christian West against such threats, these New Class forces preach cowardice, resignation, escapism, and a self-destructive humanitarianism. An ethno-masochistic response of this kind has naturally emboldened the more militant members of France’s Muslim community, who now call for jihad against the “white cheese.” Public authorities, though, persist in distinguishing between violent fundamentalists (who number perhaps 40,000) and the “peace-loving” Muslim community, unable or unwilling to acknowledge Islam’s inherent hostility to Europe’s secular society. Between orthodox and fundamentalist Islam, Faye, though, claims there is solely a difference in temperament. And even this is increasingly compromised by fundamentalist aggressions. Years before the 9/11 attack on the symbols of U.S. hegemony, this “monstrous offshoot of Judaism” had already begun its third great offensive against the dar-al-Harb, targeting Europe as a future Muslim homeland.5 Buoyed up by U.S.-protected strongholds in Southeast Europe (Albania, Bosnia, Kosovo), U.S. pressure to admit Muslim Turkey to the EU, and large stockpiles of sophisticated arms, Islamists have already begun organizing for a new conquest. It is not surprising, then, that Faye interprets the growth of European Islam as the opening salvo in a larger struggle for the continent’s future.6 Faye’s militant opposition to Islam does not, however, bear a resemblance to that of President Bush’s handlers. The struggle against Islam, he insists, is a struggle to free Europe from a dire threat to existence—not a justification for further Zionist aggression. In the coming cataclysms—likely to involve street battles between rival racial communities, guerrilla skirmishes, mega-terrorism, perhaps even small-scale nuclear exchanges with “dirty bombs,” along with conventional-style invasions from neighboring Islamic armies—Faye believes Europe will either perish or experience a rebirth. In any case, the confrontations ahead will create a situation in which the present politically correct delusions are impossible to sustain. For like every great struggle affecting human’s natural selection, war privileges the elemental and the vital. With it, the subtleties and distractions that sophists and simulators have used to misdirect Europeans cannot but cease to count, as will those minor differences that have historically divided them. Then, as “money and pleasure” cede to the imperatives of “blood and soil,” only the traditions, the way of life, and the genetic principles defining them as a people will matter. The situation the white race finds itself in today may therefore be unconditionally bleak, but in that hour when everything risks being lost, Faye believes a final opportunity for renaissance will present itself. In this vein, he predicts that the dominant musical theme of the twenty-first century will be neither an orchestral ode to joy nor the doggerel of an urban savage, but rather a solemn military march based on ancient hymns. Europeans on both sides of the Atlantic, he advises, would do well to keep step with its strong, marked rhythm. 1. L’archéofuturisme (1998); Nouveau discours à la nation européenne, 2nd ed. (1999); La colonisation de l’Europe (2000); Pourquoi nous combattons (2001). 2. See Michael O’Meara, New Culture, New Right: Anti-Liberalism in Postmodern Europe (Bloomington, Ind. : 1stBooks, 2004). 3. The number of non-Europeans in France is not officially known. The cited figure is the estimate of one of the country’s leading demographers. See “L’avenir démographique: Entretien avec Jacques Dupâquier,” in Krisis 20–21 (November 1997). Another academic (J. P. Gourevich) claims it is closer to 9 million. Some put the figure as high as 14 million, while the media usually refer to 4, 5, or 6 million. But more alarming than these figures is the fact that one-third of the population under 30 is now of non-European origins and has a birth rate four or five times higher than the European one. 4. Jeremy Rennher, “L’Occident ligoté par l’imposture antiraciste,” in Écrit de Paris 640 (February 2002). Even the politically correct editor of Violences en France (Paris: Seuil, 1999), Michael Wieviorka, acknowledges that the explosion of violence and criminality since 1990 is an outgrowth of Islamic power. Because the French government keeps most data on immigrant crime and racial terror securely under wraps, the little that is known has been surreptitiously leaked by frustrated officials. The publication with the best access to these leaks is the monthly J’ai tout compris! Lettre de désintoxification, edited, not coincidentally, by Guillaume Faye. 5. The first, Arab wave of the seventh century brought the Muslims to Poitiers, and the second, Turkish wave of the twelfth through the seventeenth centuries led to the destruction of Christian Byzantium and the siege of Vienna. The third wave, in the form of the present colonization, is stealthy in character, but potentially even more catastrophic. 6. Accordingly, the more militant Europeanists now invoke the need for a new reconquista. This is especially evident in Philippe Randa’s novel Poitiers demain (Paris: Denoël, 2000) and the album Reconquista by the group Fraction (Heretik Records). Source: TOQ, vol. 3, no. 2 (Spring 2002). Published: August 8, 2011 | This entry was posted in North American New Right and tagged about Faye, Avant-Guerre, book reviews, China, European New Right, French New Right, geopolitics, Guillaume Faye, Michael O'Meara, non-white immigration, North American New Right, o'meara on faye, reprints, the Muslim question, the United States, the yellow peril. Both comments and trackbacks are currently closed. Can’t buy wine and ham = time to plan for World War III. Let them go back to where there is no ham and wine. When soothsaying, one’s guess is as good as another’s, yet I would not quickly suggest that China will ever be in armed conflict with the US—at least in the short run, and it is too difficult to even hazard a guess for the long term. In the long, it is not clear that either the US or China will be in a position to wage world war. The US is essentially broke, and internal Chinese contradictions may well preclude belligerency between China and anyone not historically antagonistic towards them. The US has made China its de-facto manufacturing base, and depends upon China for trade/debt relief. Economically, due to the historical yuan to dollar peg, Chinese inflation is now a serious domestic problem. This, when coupled with Western recessions, tell us that on-going Chinese growth is not assured, and some now argue that China may have to rely mostly upon internal consumption in order to continue their industrial growth. At the same time, serious malinvestment is reported within the economy, and banks are said to be facing the prospect of significant domestic loan defaults. Over the past two or three years, a moderate yuan-dollar float has not allowed the RMB to achieve a realistic equilibrium against the dollar, and further appreciation will likely further reduce exports. All this suggests internal, not external problems for the CCP. Today China does not possess any strategic advantage vis a vis the West, but unlike the US, China has always shown an awareness for border security. Thus, instead of concerns over the US, it may be more important to look at China’s position vis-a-vis India, Japan, and Vietnam. Too, China faces internal ethnic problems that are quite serious, but do not at all concern the US. Tibet, but more importantly the Xinjiang Uyghur Autonomous Region, where an indigenous Muslim population is viewed by the central government as separatist. Here, Xinjiang cannot be divorced from China’s economic relations with the Middle East. Sinopec has a large economic stake in continued good relations there, and it is a big question how religion may factor into Chinese-ME dealings. Next, one cannot overlook the Chinese psychology which among the general population is actually pro-Western. The reforms of Deng Xiaoping can be said to have triumphed over the revolutionary Maoist views, and with the exception of a brief appearance on the latest CCTV gala, “90 Years of the Chinese Communist Party,” Mao mostly appears only on the money and souvenir ashtrays. The West, especially America, is viewed as rather something ideal for Chinese. They send their kids to America to go to school, they want to do business with the US, and many want to emigrate. Anyone who has visited or lived in China can tell you that Westerners are generally accepted, and are certainly not shunned as the Africans in, say, the “chocolate city” ghetto of Guangzhou. This may be an odd thing for many to understand, however among nations, China should be our natural strategic ally, and still could, but time is running short. Once the US becomes de-facto Third World as a result of the mostly Mexican reconquista, it may not make much difference one way or the other. The only Muslim nation that has The Bomb so far is Pakistan, and they don’t yet have weapons capable of reaching Europe, let alone the U.S. Besides, their primary focus is always India. It’s not clear how close Iran is to getting nukes, but even if they acquire that capability, it would be years, and probably decades, until they would have enough of them, and with weapon with sufficient reach, to pose any significant threat to the West, sort of like North Korea now. Ironically, the only Middle Eastern state that has nukes is Israel, and they have threatened to use them on European cities before in the recent past – a fact that is often swept under the rug. In addition, are there plans to translate some of Gabriele Adinolfi’s work for an English-speaking audience? Arktos will be releasing an English version of this book within the next year or so.